Catering Sites are event sites that are used in Catering Events. Sites also exist within the Scheduling Module. Click here for more information on Scheduling Sites. A Catering Site can be assigned to a Catering Event. Catering Rooms exist within a Catering Site. When selecting a Catering Site on a Catering Event, a user will then have the option of selecting (or creating) a Catering Room associated with that Catering Site. To create a new site, hover over Catering and select New Site in the top ribbon. 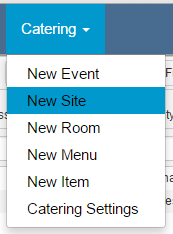 Additionally a new Catering Site can be created from within the Catering Event record by typing in a Catering Site that has not previously been created. The system will prompt the user if they want to create a new Site. To access the list of existing sites, go to Catering - Sites in the left hand navigation. You can open existing Site records by double clicking on the desired record. This will open a new window where you can view / edit the Site record. In a similar process to creating Catering Sites, Catering Rooms are created by hovering over Catering and selecting New Room in the top ribbon. Also similar to Catering Sites, Catering Rooms can be created on the Catering Event record by typing in a Catering Room that has not previously been created. The system will prompt the user if they want to create a new Catering Room. 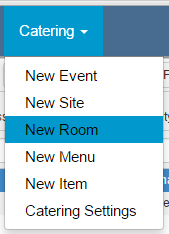 To access the list of existing Rooms, go to Catering - Rooms in the left hand navigation. You can open existing Room records by double clicking on the desired record. This will open a new window where you can view / edit the Room record.